The Extraordinary Jubilee Year of Mercy is here! You will want to browse a variety of mobile apps out there that target specific arenas of mercy which we are called to let permeate into our spiritual journey. Check back to this site for updates throughout the year as we discover more app gems out there related to this grace-filled year. We look forward to seeing your mobile app recommendations in the comments section below. Our complete overview of this app is here. 3D Catholic (Free) iOS and Android Developed by University of Notre Dame’s Institute for Church Life 3D Catholic app is designed to promote three traditional Catholic practices of prayer, fasting and almsgiving (works of mercy)–practices traditionally connected to the season of Lent. and perfect for the Jubilee Year of Mercy. But the developers hope users go beyond a one-shot attempt, so they programed in unique features designed to help the user develop a daily habit of engaging these practices cultivating a life-long practice. This is achieved by joining a community connected through this app and by setting daily reminders for prayer, fasting and almsgiving (including works of mercy). From Developers: “Join other Catholics in your area praying the Angelus every day at noon, abstaining from meat on Fridays throughout the year and performing least one corporal work of mercy weekly. View the real-time map to see where others are practicing the 3 devotions. 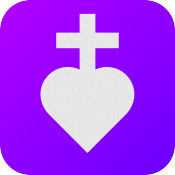 Upload prayers to the prayer intention stream and take other users’ petitions into prayer while you are engaged in the practices of the 3D Catholic community.” Check out this detailed look at the movement behind this app. We like the fact that it is a simple, yet serious attempt to help users cultivate a life-long habit of prayer, fasting and engaging in works of mercy. Just as with quality health/exercise apps, this app is integral to the process of engaging in fundamental spiritual exercises which can radically transform us in our spiritual journey. The sacrament of Reconciliation is a necessary component of receiving a plenary indulgence available during this Jubilee year. Check out our selection of apps that help walk you through the sacrament of reconciliation on our Confession Apps page. As Pope Francis wrote in his formal Letter outlining the Jubilee Year of Mercy Indulgence, “It is important that this moment [of walking through a Jubilee Holy Door] be linked, first and foremost, to the Sacrament of Reconciliation [Confession] and to the celebration of the Holy Eucharist with a reflection on mercy. This is wonderful resource….sharing with my pilgrimage group! Great idea for your group! Glad we could offer these resources to you.